Each one was printed on sheet of 50 pieces. 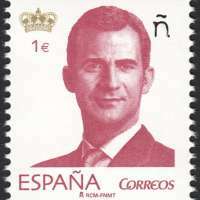 With the beginning of a new stage in the Spanish monarchy, Philip VI, King of Spain, is put into circulation a new Basic Series reproducing the effigy of the monarch. The image has been facilitated by the Royal House. The issue consists of five values ​​printed on offset and one larger intaglio incorporating for the first time this series two novelties: the realization is self-adhesive seal and includes Augmented Reality (AR). This technological mode, when captured using a Smartphone, refers to an animation and video on the figure of King Philip VI. Like other stamps issued in 2015, all have the uniqueness values ​​include the "ñ" Brand Spain. This series is completed with one artist gold proof, stamp made using intaglio using 24 carat gold covering a 999 silver base. The Basic Series, also called General or Final Series, is designed to cover a wide range of face values ​​to meet all possibilities of postage. In monarchical countries, the series is illustrated with a portrait of the monarch, such as Britain, Sweden and Spain, while in the republics is used to known images of the country or allegorical figures such as Marianne, France. Generally, the series presents some characteristics, such as making very large or unlimited print runs; play for years the same image with different colors and face values; have periods of validity and prolonged circulation or use different jagged and different printing systems. Take for reference during the reign of Juan Carlos I have circulated over 150 stamps of the Basic Series. In total we have issued six types of distinct basic series with each other, in which the image of the monarch has changed over the years. 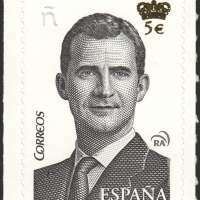 Felipe de Borbón was born in Madrid on January 30, 1968. After the abdication of his father, Juan Carlos I, on June 19, 2014 was proclaimed king by the name of Philip VI. As a head of state, symbolizing unity and permanence of the state, exerts a moderating role Arbitration and functioning of institutions and assumes the highest representation of the Spanish State in international relations.